Last week, we highlighted how Netflix, and its overwhelmingly positive analyst coverage, reveals the conflicts of interest in Wall Street research. This week, we get two more high profile examples of greed for underwriting fees coloring Wall Street analysts’ coverage of previous Danger Zone picks. Investors buying the positive analyst spin on ugly earnings reports from Tesla (TSLA: $285/share) and Spotify (SPOT: $160/share) are in the Danger Zone this week. As we noted in our previous report, investment banks make big fees by underwriting both equity and debt offerings. According to data from Thomson Reuters, underwriting fees are about $12 million for every $1 billion in junk bond issuance. Equity underwriting fees are much higher. Another Danger Zone pick, Snapchat (SNAP: $11/share), paid Wall Street about $90 million to underwrite its equity IPO. With this much money at stake, investors should not be surprised that Wall Street works hard to stay in good graces with those companies most likely to need debt (or equity) funding. In some cases, the lengths to which certain analysts will go to curry favor with potential underwriting clients are, well, worth noting. Enter Tesla and Spotify analysts. For 2017, Tesla’s cash burn rate was $6.5 billion with only $3.4 billion of cash left on the books at the end of the year. If anything, we think the cash burn rate is getting worse not better for Tesla. Nevertheless, in a bizarre conference call for Q1 earnings, CEO Elon Musk maintained he won’t need to raise capital. He was dismissive and responded rudely to questions about cash flow. Despite their criticism of Musk’s behavior, Evercore raised its price target on TSLA, and Morgan Stanley has a $376/price target on the stock, 32% above the current valuation. Both Evercore and Morgan Stanley have earned significant fees from Tesla in the past. Evercore advised the company on its acquisition of SolarCity, while Morgan Stanley helped it sell $1.8 billion in junk bonds last summer. Both companies doubtless want a piece of the action on any capital raises or deal making in the future, and they’ll be hesitant to alienate a CEO with a prickly ego when millions of dollars for their employer are on the line. The company’s cash and equivalents fell over $700 million in 1Q18 to $2.7 billion, coming off 2017 which saw Tesla burn through $6.5 billion. Since 2011, the company has burned through $25.5 billion. Naturally, Wall Street is jockeying for a piece of the next offering. Moody’s predicts Tesla will raise an additional $2 billion this year. Per Figure 1, Tesla’s cash on hand has fallen in three of the past four quarters, and now sits at its lowest level since 1Q16. In 2Q16, Tesla raised $1.5 billion. Helping fuel the cash burn, Bloomberg notes that Tesla’s ongoing hiring has created an even further strain on its finances. Compared to peers General Motors (GM) and Ford (F) Tesla brings in 2.5 times less revenue per employee. We’ve previously covered other significant issues facing Tesla, such as strong competition here. Even after falling 24% since September 2017, Tesla shares remain significantly overvalued. Comparing market cap to cars sold in 2017 shows how staggeringly overvalued TSLA is relative to peers. Per Figure 2, the market cap per car sold at GM, F, and TM is $4,497, $6,762, and $18,655. Tesla’s market cap per car sold is $465,677. TSLA’s valuation implies its cars are nearly 100 times more valuable than GM’s. At $132,985 per car (or 30 times as high as GM), the valuation is still looks ridiculous if we assume Tesla can meet its heretofore unmet production goals and sell all the cares it makes. Using our dynamic DCF model to quantify the expectations already baked into the stock price further highlights how overvalued TSLA remains. To justify its current price of $285/share, Tesla must immediately earn 8% NOPAT margins (between a mass-market and luxury car manufacturer, compared to -8% in 2017) and grow revenue by 20% compounded annually for the next nine years. See the math behind this dynamic DCF scenario here. In this scenario, Tesla would be generating just under half General Motors’ 2017 revenue. For reference, GM sold over 10 million cars in 2017 or 100 times as many cars as Tesla. More details in our last report on Tesla. As we noted in our report “How Much Should Investors Pay for Spotify,” the firm’s average revenue per user (ARPU) has been falling since 2015. This decline continued as Spotify’s 1Q18 results revealed ARPU fell to €4.72, down from €5.32 in 2017 and €6.84 in 2015. Analysts believe Spotify’s promotion of its Family Plan and discounting standard plans is to blame for the deteriorating ARPU. However, while a lower price helps Spotify grow and retain its user base, it puts further pressure on already negative margins. Adding additional pressure to margins, Spotify recently announced upgrades to its free subscription. The other issue we noted in our original report on Spotify, costs rising faster than revenue over the past two years, continued in 1Q18 as well. These rising costs, when combined with falling ARPU, make a path to profitability especially difficult. While RBC’s Mark Mahaney notes that “the business model is inflecting and the valuation is highly reasonable,” simple math shows otherwise. 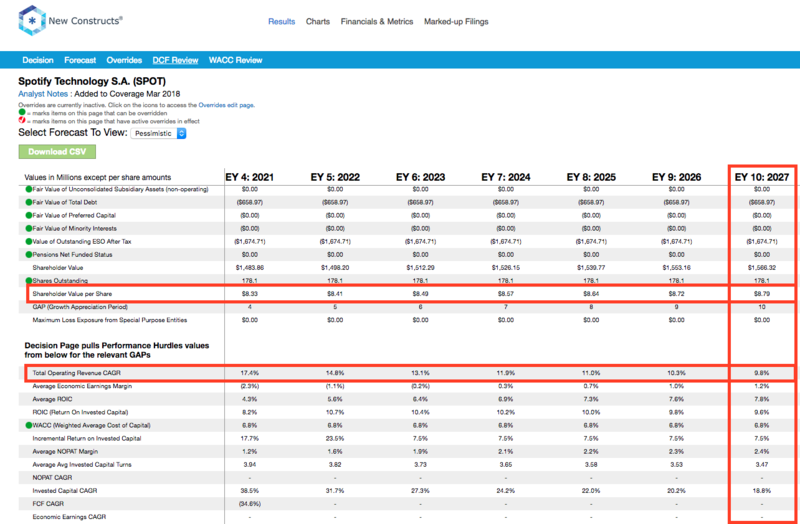 In our original report, we presented three future cash flow scenarios to help determine a reasonable price for the IPO. Scenario 1 – The Movie Theater: This scenario assumes that Apple Music and other streaming services continue to grow and challenge Spotify. As a result, Spotify grows slower than expected (midpoint of subscriber guidance for 2Q18 came in below expectations) and struggles to earn significant economic profit. If Spotify increases NOPAT margins to 3% (-8% in 2017) and grows revenue by 10% compounded annually over the next decade, the stock is worth just $9/share today – a 94% downside to the current price. See the math behind this dynamic DCF scenario here. In this scenario, Spotify would earn an ROIC of 10% compared to the -79% earned in 2017. Scenario 2 – Consolidation: In this scenario, we assume Spotify emerges as the clear winner among the various streaming services. If Spotify achieves an 8% NOPAT margin (slightly below the median of 67 media companies we cover) and grows revenue by 15% compounded annually for the next decade, the stock is worth $72/share today – a 55% downside to the current price. See the math behind this dynamic DCF scenario here. 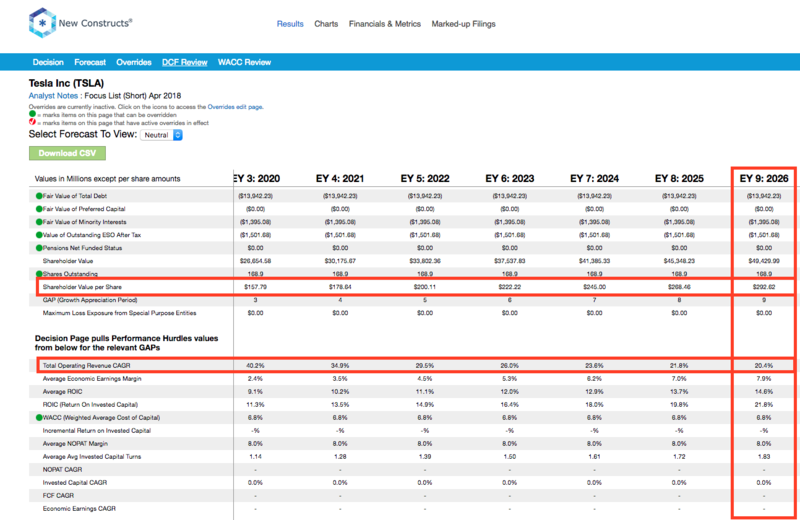 In this scenario, Spotify would earn a 21% ROIC and generate $19.4 billion in revenue ten years from now, which is 24% higher than the entire recorded music industry in 2016. Scenario 3: Ownership: In this scenario, Spotify successfully pushes out the record labels and takes ownership of all its content. 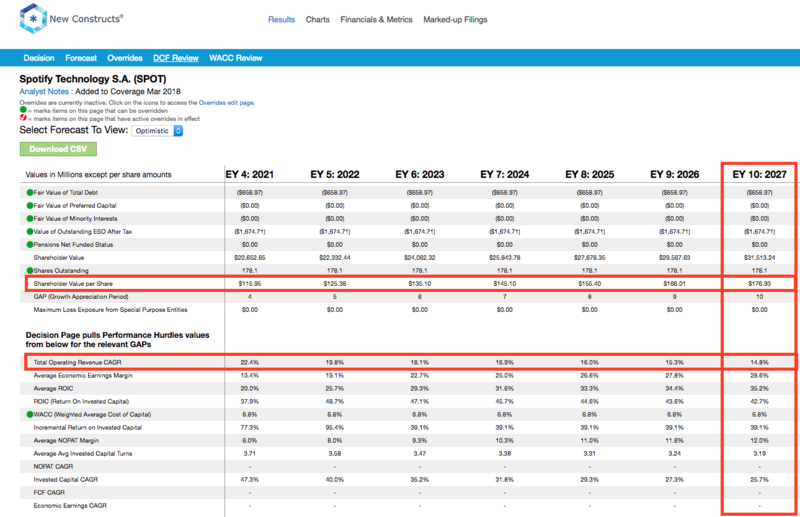 Its revenue and user growth over the next decade are the same as the consolidation scenario, but it now has the ability to earn a long-term NOPAT margin of 16%, on par with a successful content creator like Disney (DIS). 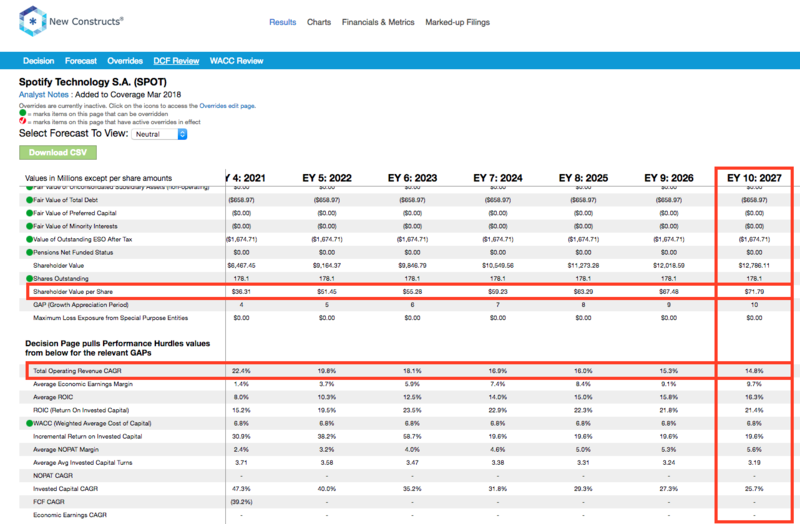 In this scenario, SPOT earns an ROIC of 43%, which would put it in the top 3% of all S&P 500 companies, and it is worth $177/share today – only 11% above the current stock price. See the math behind this dynamic DCF scenario here. Essentially, believing Spotify can achieve anything less than this optimistic scenario leaves nothing but downside for investors buying the stock today. Given the issues facing Tesla and Spotify’s businesses and the risk in their lofty valuations, it’s difficult to accept, with straight face, research that touts the “future potential” or “long-term value” of either stock. Don’t get us wrong. Some research from Wall Street is top notch. The problem is there’s no way to be sure which research is or is not conflicted given the lengthy disclaimers at the end of every report. These disclaimers protect the publishers from prosecution for nearly every imaginable conflict, including, for example, being short a stock which the report recommends buying. These issues only strengthen the case for independent research and due diligence. Investors deserve research that gets to the core drivers of valuation, and they deserve independent due diligence because it is part of fulfilling fiduciary duties. Recent advances in technology make it possible to deliver research at scale that is based on all available financial information, including items found in the footnote and MD&A. Those ignoring such technology and blindly following Wall Street research are doing a disservice to themselves and/or their clients. This article originally published on May 7, 2018. Harvard Business School features the powerful impact of research automation technology in the case New Constructs: Disrupting Fundamental Analysis with Robo-Analysts. 1 Response to "Sell Side’s Defense of Certain Underwriting Clients Reeks of Conflict"
Tesla loved by sell-side pydo-analyst. If they are analyst whySpotify, why Snap Come and misrepresent (kind word).